We don't have any trips to Bolivia at the moment . Despite not being on the list of the most popular destinations among mass tourism, making a tour in Bolivia means discovering the purest Latin America, the one that treasures the most virgin landscapes and the most authentic cities in its amazing geography. Landlocked by Chile, Peru, Argentina, Brazil and Paraguay, Bolivia is a country full of natural beauty which spans from the dusty Atacama Desert to the snow-capped Andes and the tropical Amazon basin. It’s characterized by its extremes in temperature, altitude and it’s colorful culture shown by its non-stop parades and street fiestas. Out of all of the South American countries, Bolivia has the largest percentage of indigenous inhabitants, with 60% of the population being indigenous to the country itself and around 36 indigenous languages being spoken. This makes for a fabulous mix of cultures, languages, that influence travelers interested in learning about the indigenous culture, Bolivia is the perfect place to do this, especially as the hospitality is famously warm. Much of Bolivia, for example, the administrative capital La Paz, is at a high altitude and the country is widely considered to be a highland country as many of the larger cities that are located near the Andes mountains. The biodiversity of Bolivia is one of its most impressive characteristics; with over 1,000 bird species and a great variety of other wildlife throughout the many contrasting terrains of the country. The adventurous will undoubtedly want to venture into the Amazon in Bolivia where it is less crowded than in other regions. Passport with at least six months validity. One blank passport page. Please consult your doctor about the yellow fever vaccine to see if it is required. 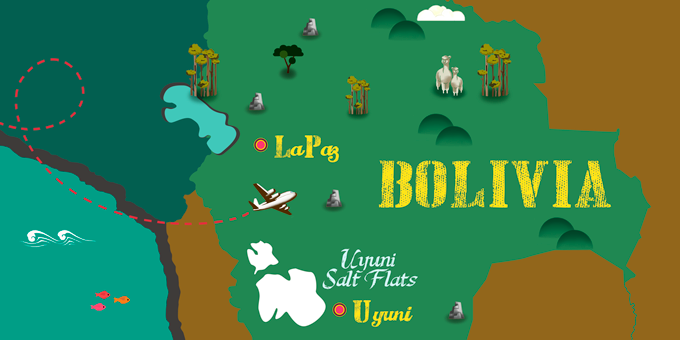 If Bolivia has caught your attention, leave us your number so we can call you to discuss the voyage that awaits you.